Hi and welcome to our fourth tutorial in this series. Today i will be teaching you guys how to use Github, as I will be posting all the codes that we will be working on there. This will help you follow up easily and do some practicals later on your own. Lets get started with Github! To complete this tutorial, you need a GitHub.com account and Internet access. You don’t need to know how to code, use the command line, or install Git (the version control software GitHub is built on). First, we need to install Git (Windows Users), Linux and Mac OS users can do git operations on the Terminal. When you’ve successfully started the installer, you should see the Git Setup wizard screen. Follow the Next and Finish prompts to complete the installation. The default options are pretty sensible for most users. $ git config --global user.name "Emma Paris" $ git config --global user.email "eparis@atlassian.com"
Git will be useful in performing the git operations from the Command Line in Windows machines. In the upper right corner, next to your avatar or identicon, click and then select New repository. Click the pencil icon in the upper right corner of the file view to edit. These changes will be made to just the README file on your readme-editsbranch, so now this branch contains content that’s different from master. Select the branch you made, readme-edits, to compare with master (the original). Take a look at your GitHub profile and you’ll see your new contribution squares! This procedure assumes you have already created a repository on GitHub, or have an existing repository owned by someone else you’d like to contribute to. 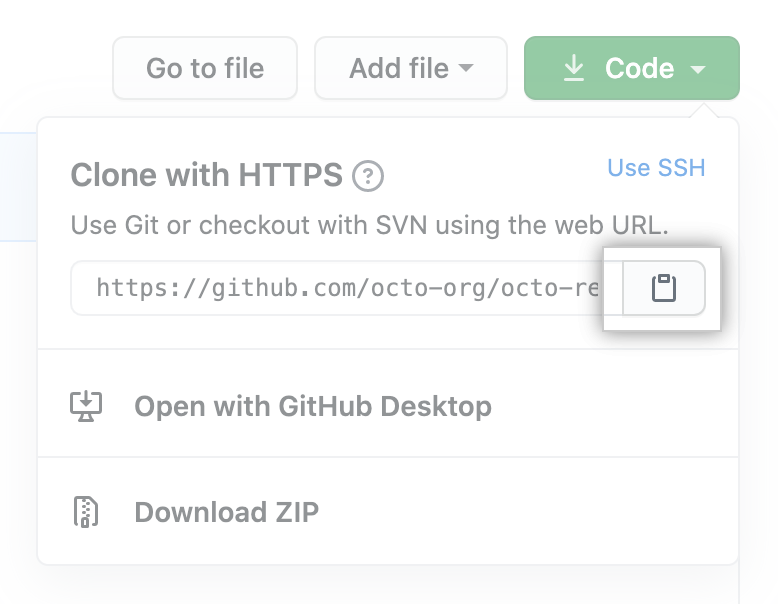 Under your repository name, click Clone or download. Open Git Bash (Windows Users) and Terminal in Linux and Mac OS. git clone https://github.com/YOUR-USERNAME/YOUR-REPOSITORY Cloning into `Spoon-Knife`... remote: Counting objects: 10, done. remote: Compressing objects: 100% (8/8), done. remove: Total 10 (delta 1), reused 10 (delta 1) Unpacking objects: 100% (10/10), done. Git clone allows you to pull someones code to your local machine, all the code that we will be working on during this tutorial sessions will be available to all. Feel free to clone anytime and also get in touch if you need help or get stuck along the way.